information how i can mount this lamp. But i want mount directly on celling picture below V1. But I wonder that is possible, or not. May be it is impossible because of cooling, or lamp dosn’t have holls for mounting. I send question to many reseller but nowbody send me any information. I have exactly same question and according to the sales advertisement this panel light can be installed on the surface, so you do not need a hole in the roof for the panel or for the transformer. I bought this from aliexpress and got it today, but there is nothing with it I could install it on the roof surface. Also the 1.3cm is kind of face info as the transformer is much taller. 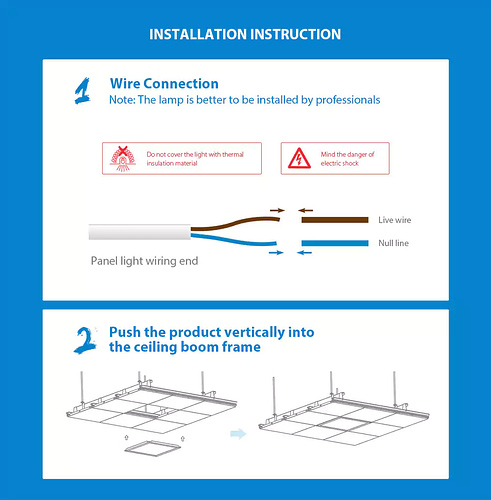 So some special connection rods etc is needed especially made for this panel light is needed in order to be able to install it on the surface like on the sales advertisements seen on internet. Can you put some foto how it looks like form celling side. when you manage with mount please give me some information how you do that. I’ve looking on aliexpress and other sellers and cano’t find systems to mount this. If you have some advise how i should search please give me advise. Lets see how my seller answers to my dispute at Aliexpress. Have you answer from seller about instalation rods ? Or may be you solve mounting in other way? Have you got an answer from your seller? I have same problem. Do not know how to mount it. No, i asked each seller from Aliexpress, gearbest, and other shops and nobody give me any information. So, sad that there is totally wrong information on marketing material or no one knows from the retailers how to order these accessories for ceiling surface installation. Hello! Did someone fix it to the ceiling? Maybe the forum administration will tell us something? would you be kind enough to share a link to this mounting bracket?